"The fun begins as soon as you walk through the door"
The familiar red and white, stripped canopies that shade the gleaming TGI Friday's are a beacon to children. Glowing Tiffany lamps in the windows, American memorabilia all over the walls and helium balloons bobbing about the place. The fun begins as soon as you walk through the door. Deal: Children's main courses from �2.99; dessert from 99p. Are they pleased to see you? The service is like nothing you will ever experience! The staff belong in a High School Musical stage show, with their starched aprons, jingling badges and huge, preppy smiles. Food: A massive choice for adults - almost too much! 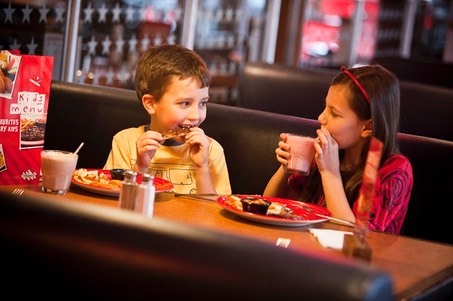 The kids menu features pirate fish fingers, macaroni cheese or a giant hot dog (all �2.99) and a fabulous ice cream dessert called dirt and worm pie (�1.99) which the kids thought was hilarious! Would a veggie starve? No, there are heaving plates of innovative salads and there's even a Lactose/Gluten-free menu for kids and adults. Facilities for the Kids: Great little activity pack, face-painting, and fairy wings handed out at the weekend plus balloon making and our very own magician/comedian to entertain us at the table! Would you come again? Yes, next time without the children so we can hit the cocktail list! Kids verdict - "I wish we could live here so we could come every night. The worms are the best I've tasted!"